New Plots now released on this AWARD WINNING developemt. 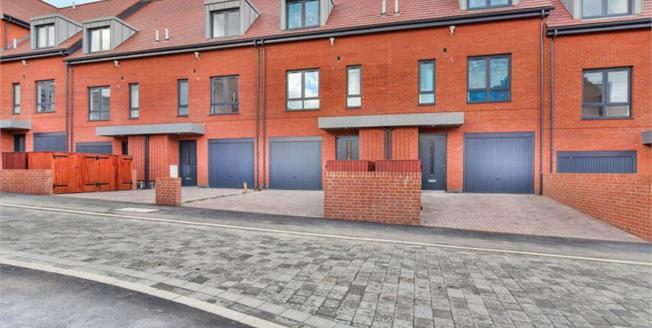 The Victoria is a three-storey four bedroom townhouse, with front and rear gardens and garage. The ground floor comprises has a garage, entrance hall and a downstairs cloakroom. There is a stunning kitchen dining room at the rear with glazed patio doors leading to the rear garden. The high quality kitchen is fully fitted with oven, hob, fridge freezer, microwave and dishwasher. To the first floor ther is a formal lounge to the rear, cloadroom and bedroom one with ensuite. The second floor comprises three further bedrooms and another bathroom. The rear garden is turfed with a patio area all enclosed with timber fencing. The property is situated in charming, picturesque grounds of approximately 17 acres, this development consists of 39 historic apartments and townhouses, surrounded by 117 sympathetically designed new homes. Barnes Village: a classic quarter for contemporary living. Barnes Village is a contemporary restoration of this magnificent Grade II listed building, amongst a collection of luxurious and elegant family homes. Whether you require a beautiful new home, or a rewarding property investment Barnes Village is an attractive prospect.